Here are the transcripts in their entirety starting with June 18th, about four hours after McPhee was handed the lists of protected and available players. This has been a fascinating experience to date. There was a certain intensity to the last two or three days because we were trying to keep an eye on all the other clubs and it certainly changed today. It’s a different phase. We have some control over what’s happening now, but now we’re on the clock. We have looked at the lists and there were no surprises. We have been really well prepared. Those mock drafts that we did have served us well. So, we are now going through the process of trying to put the team together. We are still talking to clubs and we are open to doing deals with clubs if they want to protect their rosters. So, that’s where we are this morning and we analyzed what transpired with the lists this morning, and there wasn’t a whole lot to analyze and we are now talking to teams. It’s mostly the other clubs, and certainly will be henceforth. There are clubs that want to do some things and they have been calling us. That was the bigger surprise yesterday, because we were expecting this mass redistribution of players that really didn’t happen, which we were really happy about. Well, what it does is, some of the things we were worried about with no-move clauses and that sort of thing didn’t happen, and I think the harvest of assets that we are going to have now will be what we were hoping for. Well, 2% more. But no, we’re going to do what we have to do to build a good team, and if we have to go over the cap, we will. But, that affected other teams more than it affects us. We’re doing what’s best for this hockey club and we think we can accomplish two things. We can put a good team on the ice and accumulate draft picks and be in a surplus situation here in the next couple of years so that we can start with a real good team and then build it with these draft picks to a team that can win a Cup. We knew that when we got into this window, the expansion window, that we would have some control. I thought we did real well in the weeks leading up to this, talking to teams about what we might be able to do and getting in the way of some things that may have happened with other clubs. So, I would say that if we were grading ourselves on how we’ve done things to date, it’s an A+. Really really happy with the way it’s gone. Now we need to get an A+ for these next three days. We’re focusing on everything. We’re talking to unrestricted free agents, we’re talking to restricted free agents, and we continue to talk to teams. No, as I said earlier on, there are no surprises for us. We’ve done this well enough that we were happy with what we saw this morning. I can’t get into specific names at this point. We do have a show in three or four days that we want to go real well. Until a player is our property, I can’t talk about them. We don’t have anything, we have lots of things lined up. But until we see everything, we don’t have anything. We’re going to make all of our final decisions late because we don’t know what kind of calls we’re going to get today. They may be different than the calls the same manager may have different things to talk about today, now that we’re in the expansion window, than he did the last few days. Yes. 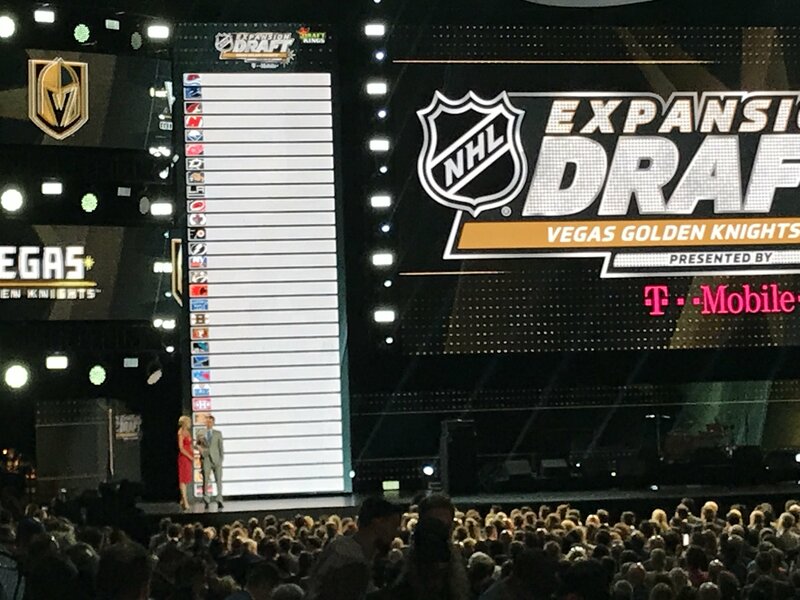 We’re really pleased with what’s available and this, as I’ve said, has worked out very well for the Vegas Golden Knights. We expect to put a good, competitive, entertaining club on the ice. We really like what we’re looking at right now and then, again, we thought it was important to get those picks to help us draft our way to a championship. Yes. That’s a very good question. The issue for us isn’t going to be ‘can we fill out the roster?’ it would be ‘do we have too many players?’ There are lots of good players there, and we have sort of a master list right now, a team up on the board with all the possibilities, which is different than what we did leading into this with individual clubs. Now, this is our club that’s up on the board. We are going to be taking things out or marking a guy in blue because he’s a blue-chip guy, he’s going to be here. Yes. Yeah, we expect that that will happen today. In fact, it’s already started to happen. People have identified people on other clubs that they’d like to have and we have to establish the value for that and whatever you want to give us has to be better than what we can claim from that club. So, that is starting to happen and then we’re going to go to that club and say ‘We have interest in this player. There’s another club that has interest in this player. How do we want to do this? How can we protect your roster? You can negotiate your way out of this if you wish. Every team in this league has a chance to protect their roster. We will not make a claim with any club before we talk to the club. Beyond the first couple of weeks when I was upstairs by myself trying to sort things out, I am amazed at how well this has gone for us and I think we did an outstanding job of hiring people. Sitting in that room, we have tremendous chemistry in the room. There, that’s one team we have, and then our amateur scouts, it’s the same sort of thing. We have great chemistry in the room, and that has made this, again, just a wonderful experience for all of us. We have smart people in there, experienced people in there, and we get to a place with some healthy debate, but no arguing. Lots of understanding and it’s really been a pleasure. Dealing with the other GMs is similar to what we’ve done in the past. Some of the things we’ve done internally out-of-the-box has been really neat for me personally to see what some of these young people that we have on our staff have created, some of the tools that we’ve used have been really neat. It’s just a different generation and how they do things. So, that has been a neat experience. Negotiating with GMs has been the same, but maybe the best way to put all of it on this whole experience, there’s just a glow about it. You know? It’s been such a positive experience for all of us that I’m keeping my fingers crossed, hoping it can continue to go the same way. The last 24 hours has been similar to the last three or four days in that we are having discussions with clubs about what they want to do and how they can protect their rosters if they want to do that. What we’ve told everyone today is that today will be the last day that we are going to have those discussions, that we are going to pick our team tomorrow. We want to have a discussion with the league tomorrow night about what our team is going to look like to make sure we meet all of the requirements, and then if everything’s okay, I’ll sleep on it and then just send it in Wednesday morning. But, today is the last day for those discussions. No. Everything is, we have things lined up, but nothing is final until everything is final. We’ve had a lot of discussions with free agents, we’ve had a lot of agents call, healthy discussions, and at this point, I don’t know what direction things will go with respect to free agents. But, we are having a lot of dialogue with them. Midnight eastern standard time would be ideal. But, we’ll see. But, we will be done with discussions tonight. I’ve been on the phone all day long for four or five days here. Hard to quantify that. We’re just, as you talk to each team, you try to figure out what makes sense for them and for us, and you put it up on the board and we’ll see where it goes. I don’t think you can ever have too many picks. Sometimes, that gets hard to manage in a draft. So, could we spread them out? Sure. Yeah, there has been a lot of inquiries about players on other teams. All of the GMs have looked at the lists and they see players on the other teams and have asked us ‘What would it take for you to claim that player for us?’ And our response is ‘We’re either going to claim that player for us and keep him or the value you give to us has to be better than something else we could have claimed from that team.’ And will there be some players announced on Wednesday that aren’t with us in a couple of weeks? Maybe. It’s a real possibility. The balance is whatever feels right for our team and we just had that discussion 30 minutes ago on one particular transaction that may happen where there’s a player there that we think would be really good for our team, another offer has come in on that player that is really a nice, healthy offer that we also like, but what’s best for our team? What’s best for our team is keeping the player. So, that’s essentially how we measure things. Not today. In 3 or 4 days from now, I won’t be able to remember any of these conversations, so it’ll probably never happen. I anticipated that question, and it’s really all over the place. Managers have different holes they want to fill, and so the requests have come in and some of them are interesting because it’s not someone that we were going to claim, but it fits for their team. Yeah, I don’t know if we’re smart enough to really complicate things too much, and this is a complicated process. Because, as you can imagine, and one of the reasons we want to finish the dialogue today and pick our team tomorrow, is it’s going to take us awhile to pick the team tomorrow. Because one change in this matrix affects everything with your cap now, with your cap going forward, with the cap that you have done for this expansion draft, with the cap that you need for the regular season, tagging room and everything else, is a player under contract, not under contract, does he fit one of the positional requirements. So, that’s why you can’t get too cute and try to complicate it too much. We’re just being real direct with people and when we call managers back, we’re basically saying ‘Do you want to hear what’s going on with your team or are you just content to sit and we’re going to do what we’re going to do?’ And most of them want to talk about it and then we tell them exactly what’s going on, and is there something you want to do about it or not? And so, that’s the way we’re doing this because it is a very complicated process. Oh sure. Yes. Yes. And at this point, we’re trying to block out with each team, do we know exactly what we’re doing with that team? Is anything else going to affect that? And if it’s not, then we are boxing that player out as the guy we’re going to pick. No, we’ve got another office in there preparing for the entry draft. We’re doing most of the expansion stuff during the day and at the end of the day, when everybody’s tuckered out, then we go in and deal with the amateur stuff. Yeah, we’re in a good place. We’re really well-prepared for it, and as you know, we’ve had an entire year to prepare for both of these drafts, and we are prepared and organized and that’s why I feel a little more relaxed up here than I anticipated I would be at this time, but we are in a good place. He is sitting right next to me and he is absorbing everything and has really, for the most part, just taken it all in and letting us do our work. That’s a good question, Scotty. They have been very excited. They have been delighted to hear from us and have been aggressive in trying to do things with us, so that obviously, that’s fantastic for this franchise. Well, because the free agent is better than anything we could pick from that team. That’s why we’d sign them. Hi, everyone. First update would be that we’re in a really good place. We’ve done well in terms of timing on everything. We wanted yesterday to be our final day of discussions with clubs. There were a few GMs that had some travel issues last night, who requested to talk today. So, we’ve agreed to do that and we’re doing that this morning and we’ll wrap that up soon, I hope, and then start picking our team. No. No. The league has been great. We are going to use every minute that we have and we’ll put our team together today and hopefully not have to go too deep into the night and we’ll submit it about five minutes before 7 AM tomorrow. I don’t know. I don’t know the answer to that question. We’ve done a lot of things. Transactions? Yeah. Yeah, certainly at least that. We’ve tried to talk to every club before we make a selection, and different things result from that. I certainly haven’t been able to keep track of it, and I guess we’ll tally it all up at the end and you guys can tell us how we did. There’s been some of that, yeah. Probably more of it after the Expansion Draft. We’ll make phone calls later on today, I guess, and try to get them here for tomorrow. Actually, I think we’ve done pretty well in all the positions. We have lots of defensemen lined up, we have lots of centers and we have scoring on the wings, a little more scoring than we anticipated. The goaltending is going to be pretty solid. It’s looking pretty good. It’s what we’ve been trying to accomplish and that is have a competitive club that people are going to enjoy watching play, and then having the draft picks to be able to draft our way to a contending team, a championship team. It’s really hard to believe we’re here now and we’re submitting this list tomorrow. Three days ago, we had a whiteboard with no names on it, and now it looks like we’ve got a hockey team. And we like the way it looks and we’ve got a few things to move around and change, but it’s interesting that the debate has gone from ‘What are we doing with clubs?’ to now, we have a couple of things to wrap up, but now we’re entering that phase where, you know, what kind of flavoring do we have to add to the team? What other things do we need to do here? And it’s all about what we look like and do we have left shots or right shots or do we need to move a center to a wing and we’re going to have to move some defensemen because we’re going to claim a bunch and so things of that nature. Well, we have a show to do tomorrow night, and we’ve gotten this far, sort of protecting that show, and I think it’s going to be a real exciting event to have everything laid out, the players that are going to become Vegas Golden Knights and then you can look at our draft picks, and again, you can evaluate how we’ve done. Yes. Well, we knew that from the start that we were going to claim 30 players. But, your roster can only be 23, you can only dress 18 and 2. But, we understand and I don’t know that the terminology is the right terminology, but people call it ‘throwaway picks.’ There are some teams where there isn’t a whole lot to do and you’re going to make a throwaway pick rather than taking on a contract that you don’t like. So, there will be some of those claims, people that won’t be qualified, and that sort of thing. Well, we’ll find out tomorrow night, I guess. That’s what the show is all about. Yes. Well, there are going to be some guys that we hope will be core players for us for a long time. No. It hasn’t affected, it’s three or four, yeah. I was talking to Lou Lamoriello last night, he had travel issues and so we talked last night at 11:30, and then we talked again this morning at about 4:45. And then there were a couple of guys in the East, one in the West that were trying to get here and had some issues. But, nothing major in terms of deal- making. I think we just need to talk one more time and we’ll know where we are. Well, no, that was just, we have different, we’ve got all kinds of different screens that we’re working off of that were getting us different kinds of data that we needed. And just in terms of trying to put the team together, again, it’s not easy, because you’re trying to put all of these bodies together and you have to meet all these requirements, and again, as I mentioned yesterday, if you move one, if you make one change, it sort of changes the whole matrix. So, we just designated certain people in blue and I always use blue sort of as a ‘blue chip’ in ratings, and we usually have lots of different ratings. But, blue in this case was, this was probably a player that we’re claiming and keeping and don’t have interest in moving, and we used a different color for a player that we would claim and may have to move, just to allow us to see what the team sort of looks like as we’re making all the deals. Well, that’s a great question, I really, as we’ve talked a number of times about the importance of your culture and everything else, and sometimes that gets to be cliché, people really don’t understand what it is. But, your culture really is important in performance and in winning and our colors stand for something. Bill Foley is a West Point guy, sort of using those colors. You know his history at West Point, you know about the classmates he had that he lost serving this country. So, those colors mean a lot to us, and will mean a lot to our players. And we’re really proud of the logo. It’s clean, it’s symmetrical, it’s kind of bold, and again it stands for something. Bill has mentioned a number of times what the Knights stood for: protecting their realm, never retreating, and always attacking. That was one of the things that we had to accomplish when we were putting this franchise together. We suddenly had to come up with uniforms and a logo and those things take awhile. I remember the ones that are being worn in Washington now, it took us two years to get those right. Because you sit down with people, you tell them what you like, what you don’t like, they try to create something. They come back three months later, and you either like it or don’t like it and they go away and then they come back. We did this in a couple of months, I think, and it turned out really nicely. It’s one of the many things that we’re proud of on this journey. I think it’s going to be a pretty good team. We’re happy that, you know, we got a lot of defensemen, we got really good goaltending, we’ve got a lot of centers and we’ve got scoring on the wings. Should have good speed, so it’s going to be a good team. No. No. We worked really hard at this, as you know. We’ve needed the whole year to do it. We’ve talked to a lot of people about how to do it. We’ve done a lot of planning, we’ve had a great blueprint. And it’s worked very, very well. We’ve gotten through this process. I had some concerns yesterday about 1:00 about whether we were going to have enough time. It was kind of overwhelming, but we were handling it. And then we sort of looked up at the clock at 4:00 and said, ‘You know, we’re going to be alright. We’re going at a good pace and things are falling into place.’ So, it’s worked. It’s kind of like going in for a final exam and knowing you know it. There haven’t been that many surprises. Doug Risebrough said six or eight months ago when we met, you know, ‘You can’t plan for everything, there will be some uncertainty.’ But, I think we actually planned for everything. We’ve done alright. Tonight, I hope I can. I got to bed about 12:00 last night and I woke up at 3:10 and I was like ‘Boing, here we go. I’ve got to go.’ I was up and came in. So, hopefully we’ll get the team put together and we’ll be ready to send it in in the morning. We’ll sleep on it and send it in the morning, but I think we’re ready to go. Wow—–what a great read. Good job, thanks. I can’t wait to see the documentary. Should be amazing.